MT20 is a low-profile, high-performance 1D barcode imager that is designed to deliver great scanning performance while being able to fit into most space-constrained applications, including mobile device, wearable device and smartphone. 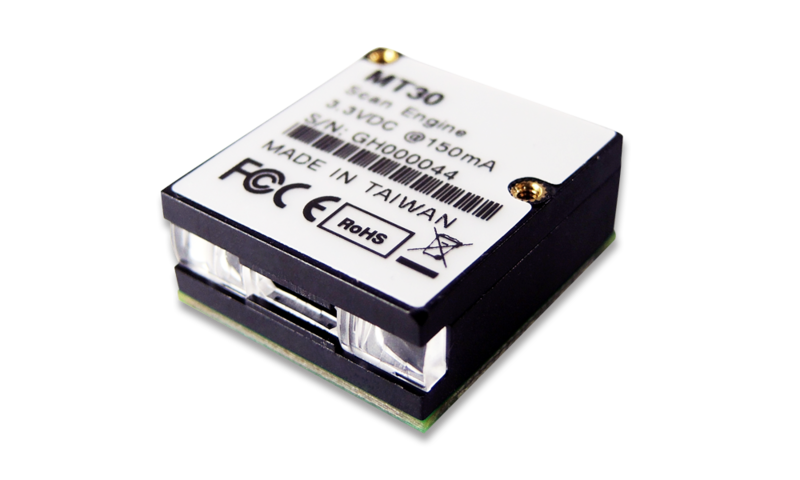 With limited components and low power consumption , MT20 is ideal for host device with limited space and battery. MT20 scan engine is a low-profile lightweight 1D barcode imager. With the size of W17.65 x L12.12 x H8.27 mm and the weight of only 1.4 grams, MT20 can fit into the most space-constrained product, thus providing unparalleled flexibility for product design. MT20, with enhanced optical design, virtually scans all 1D barcodes on any surface, either paper-based label or mobile phone display. With MT20 scan engine integrated into mobile device, users may expand their business into many new applications such as eCoupon, eTicket, Digital ID cards and mobile payments. With golden fingers for connection, MT20 scan engine can be firmly mounted on the host PCB with soldering, which not only increases mechanical reliability but reduces cost and risk incurred in installing flex cable and connector. MT20 provides analog output directly to the host, which can be processed by developer's own software decoder with all kinds of desired features and functionalities. ** Note：The performance comes with MTXXX decoder board.